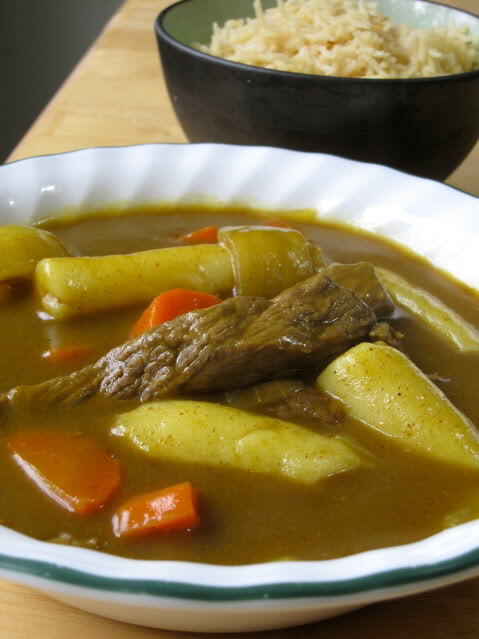 Ottogi Curry is a Korean-Indian fusion recipe developed by Korean food company Ottogi in the late 1960’s. Traditionally cooked up with carrots, onions, potato and juicy chunks of beef, it would not grace the tables of the average Indian home because of the Indian taboo against eating beef. Koreans have put their own unique spin on curry and they consume lots of it. So today, I’m making a Korean Curry Tteokbokki featuring Ottogi’s hot curry paste mix. In this version, I’m leaving the potato out since we’re already adding a starch in the form of the Garae tteok noodles. Here’s my improvised recipe based on the recipe usually posted on the back of the Ottogi curry spice packet. Cut the beef,onion, and carrot into slices, then saute lightly in grape seed oil. Add 3 cups of water to the vegetables and bring back to boil. Mix curry powder with 1/2 cup of water until it’s a moist paste and then add the curry paste to the rest of the mixture and continue simmer until the beef is nearly cooked. Add the Garae tteok and cook for an additional 5-10 minutes until the Garae tteok are ready. sounds yummy! bought a big pack of the ottogi curry powder today! Yummy! Also try satay-style peanut sauce with tteok… to die for. Quick peanut noodle sauce is peanut butter and shoyu with squirt of sriracha or other chili sauce — sriracha ketchup is even better because of the sugar. I use dark shoyu, crush a garlic clove and heat up a spoon of good Madras curry powder with a spoon of oil in the microwave to ‘wake up’ the spices. Lashing of chili oil and you have curry peanut noodle or tteokbokki in 5 minutes. Sprinkle with chopped peanut, green onion, fried garlic for crunch. Also many recipes say boiled tteok does not keep, treat it like any noodles and toss with a little oil, refrigerate. When you want some more, sprinkle water to loosen up the pieces and heat a serving in the microwave with a spoon of water. Drain and you’ve got hot soft tteok ready to go!